The Thing is an quarterly periodical in the form of an object with text. Each issue is created by an artist, wrapped by the editors and then sent to the subscribers. THE THING is a quarterly periodical in the form of an object. Each year, four artists, writers, musicians or filmmakers are invited by the editors ( Jonn Herschend and Will Rogan ) to create an everyday object that somehow incorporates text. 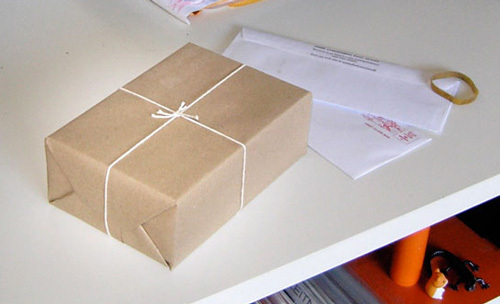 This object will be reproduced and hand wrapped in brown paper packaging by the editors and then mailed to the homes of the subscribers with the help of the United States Postal Service. The Thing is based out of Southern Exposure in San Francisco. Emily of SFist recently did an interview with Jonn Herschend and Will Rogan, creators of The Thing. Thanks to Helena Nolan for the tip!